5-HT1B receptors are widely distributed throughout the central nervous system with the highest concentrations found in the frontal cortex, basal ganglia, striatum, and the hippocampus. The function of the 5-HT1B receptor differs depending upon its location. In the frontal cortex, it is believed to act as a postsynaptic receptor inhibiting the release of dopamine. In the basal ganglia and the striatum, evidence suggests 5-HT signaling acts on an autoreceptor, inhibiting the release of serotonin and decreasing glutamatergic transmission by reducing miniature excitatory postsynaptic potential (mEPSP) frequency, respectively. In the hippocampus, a recent study has demonstrated that activation of postsynaptic 5-HT1B heteroreceptors produces a facilitation in excitatory synaptic transmission which is altered in depression. When the expression of 5-HT1B in human cortex was traced throughout life, significant changes during adolescence were observed, in a way that is strongly correlated with the expression of 5-HT1E. Outside the brain, 5-HT1B receptor activation also has vascular effects, such as pulmonary vasoconstriction. Furthermore, blocking 5-HT1B receptor signalling increases the number of osteoblasts, bone mass, and the bone formation rate. Knockout mice lacking the 5-HT1B gene have shown an increase in aggression and a higher preference for alcohol. Under basal conditions, knockout mice present with a "normal" phenotype and exhibit a sucrose preference (lack of sucrose preference is considered a measure of anhedonia). However, after undergoing chronic unpredictable stress treatment to induce a "depression-like" phenotype these animals do not benefit from administration of selective serotonin reuptake inhibitor (SSRIs). ^ Jin H, Oksenberg D, Ashkenazi A, Peroutka SJ, Duncan AM, Rozmahel R, Yang Y, Mengod G, Palacios JM, O'Dowd BF (Mar 1992). "Characterization of the human 5-hydroxytryptamine1B receptor". The Journal of Biological Chemistry. 267 (9): 5735–8. PMID 1348246. ^ Sanders AR, Cao Q, Taylor J, Levin TE, Badner JA, Cravchik A, Comeron JM, Naruya S, Del Rosario A, Salvi DA, Walczyk KA, Mowry BJ, Levinson DF, Crowe RR, Silverman JM, Gejman PV (Feb 2001). 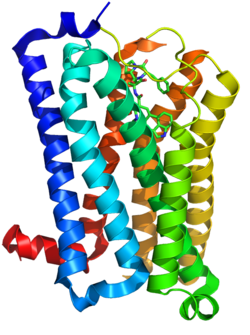 "Genetic diversity of the human serotonin receptor 1B (HTR1B) gene". Genomics. 72 (1): 1–14. doi:10.1006/geno.2000.6411. PMID 11247661. ^ Pytliak M, Vargová V, Mechírová V, Felšöci M (2011). "Serotonin receptors - from molecular biology to clinical applications". Physiological Research / Academia Scientiarum Bohemoslovaca. 60 (1): 15–25. PMID 20945968. ^ Huang CC, Yeh CM, Wu MY, Hsu KS (Jun 2013). "A single in vivo cocaine administration impairs 5-HT(1B) receptor-induced long-term depression in the nucleus accumbens". Journal of Neurochemistry. 125 (6): 809–21. doi:10.1111/jnc.12227. PMID 23452061. ^ a b Cai X, Kallarackal AJ, Kvarta MD, Goluskin S, Gaylor K, Bailey AM, Lee HK, Huganir RL, Thompson SM (Apr 2013). "Local potentiation of excitatory synapses by serotonin and its alteration in rodent models of depression". Nature Neuroscience. 16 (4): 464–72. doi:10.1038/nn.3355. PMC 3609911. PMID 23502536. ^ Shoval G, Bar-Shira O, Zalsman G, John Mann J, Chechik G (Jul 2014). "Transitions in the transcriptome of the serotonergic and dopaminergic systems in the human brain during adolescence". European Neuropsychopharmacology. 24 (7): 1123–32. doi:10.1016/j.euroneuro.2014.02.009. PMID 24721318. ^ Yadav VK, Ryu JH, Suda N, Tanaka KF, Gingrich JA, Schütz G, Glorieux FH, Chiang CY, Zajac JD, Insogna KL, Mann JJ, Hen R, Ducy P, Karsenty G (Nov 2008). "Lrp5 controls bone formation by inhibiting serotonin synthesis in the duodenum". Cell. 135 (5): 825–37. doi:10.1016/j.cell.2008.09.059. PMC 2614332. PMID 19041748. ^ Hoyer D, Hannon JP, Martin GR (Apr 2002). "Molecular, pharmacological and functional diversity of 5-HT receptors". Pharmacology Biochemistry and Behavior. 71 (4): 533–54. doi:10.1016/S0091-3057(01)00746-8. PMID 11888546. ^ Nguyen L, Thomas KL, Lucke-Wold BP, Cavendish JZ, Crowe MS, Matsumoto RR (2016). "Dextromethorphan: An update on its utility for neurological and neuropsychiatric disorders". Pharmacol. Ther. 159: 1–22. doi:10.1016/j.pharmthera.2016.01.016. PMID 26826604. ^ Hudzik TJ, Yanek M, Porrey T, Evenden J, Paronis C, Mastrangelo M, Ryan C, Ross S, Stenfors C (Mar 2003). "Behavioral pharmacology of AR-A000002, a novel, selective 5-hydroxytryptamine(1B) antagonist". The Journal of Pharmacology and Experimental Therapeutics. 304 (3): 1072–84. doi:10.1124/jpet.102.045468. PMID 12604684. ^ Selkirk JV, Scott C, Ho M, Burton MJ, Watson J, Gaster LM, Collin L, Jones BJ, Middlemiss DN, Price GW (Sep 1998). "SB-224289--a novel selective (human) 5-HT1B receptor antagonist with negative intrinsic activity". British Journal of Pharmacology. 125 (1): 202–8. doi:10.1038/sj.bjp.0702059. PMC 1565605. PMID 9776361. ^ Roberts C, Watson J, Price GW, Middlemiss DN (2001). "SB-236057-A: a selective 5-HT1B receptor inverse agonist". CNS Drug Reviews. 7 (4): 433–44. doi:10.1111/j.1527-3458.2001.tb00209.x. PMID 11830759. ^ Tsai SJ, Wang YC, Chen JY, Hong CJ (2003). "Allelic variants of the tryptophan hydroxylase (A218C) and serotonin 1B receptor (A-161T) and personality traits". Neuropsychobiology. 48 (2): 68–71. doi:10.1159/000072879. PMID 14504413. Olivier B, van Oorschot R (Dec 2005). "5-HT1B receptors and aggression: a review". European Journal of Pharmacology. 526 (1–3): 207–17. doi:10.1016/j.ejphar.2005.09.066. PMID 16310769. Veldman SA, Bienkowski MJ (Sep 1992). "Cloning and pharmacological characterization of a novel human 5-hydroxytryptamine1D receptor subtype". Molecular Pharmacology. 42 (3): 439–44. PMID 1328844. Demchyshyn L, Sunahara RK, Miller K, Teitler M, Hoffman BJ, Kennedy JL, Seeman P, Van Tol HH, Niznik HB (Jun 1992). "A human serotonin 1D receptor variant (5HT1D beta) encoded by an intronless gene on chromosome 6". Proceedings of the National Academy of Sciences of the United States of America. 89 (12): 5522–6. doi:10.1073/pnas.89.12.5522. PMC 49324. PMID 1351684. Levy FO, Gudermann T, Perez-Reyes E, Birnbaumer M, Kaumann AJ, Birnbaumer L (Apr 1992). "Molecular cloning of a human serotonin receptor (S12) with a pharmacological profile resembling that of the 5-HT1D subtype". The Journal of Biological Chemistry. 267 (11): 7553–62. PMID 1559993. Mochizuki D, Yuyama Y, Tsujita R, Komaki H, Sagai H (Jun 1992). "Cloning and expression of the human 5-HT1B-type receptor gene". Biochemical and Biophysical Research Communications. 185 (2): 517–23. doi:10.1016/0006-291X(92)91655-A. PMID 1610347. Nöthen MM, Erdmann J, Shimron-Abarbanell D, Propping P (Dec 1994). "Identification of genetic variation in the human serotonin 1D beta receptor gene". Biochemical and Biophysical Research Communications. 205 (2): 1194–200. doi:10.1006/bbrc.1994.2792. PMID 7802650. Ng GY, George SR, Zastawny RL, Caron M, Bouvier M, Dennis M, O'Dowd BF (Nov 1993). "Human serotonin1B receptor expression in Sf9 cells: phosphorylation, palmitoylation, and adenylyl cyclase inhibition". Biochemistry. 32 (43): 11727–33. doi:10.1021/bi00094a032. PMID 8218242. Bouchelet I, Cohen Z, Case B, Séguéla P, Hamel E (Aug 1996). "Differential expression of sumatriptan-sensitive 5-hydroxytryptamine receptors in human trigeminal ganglia and cerebral blood vessels". Molecular Pharmacology. 50 (2): 219–23. PMID 8700126. Varnäs K, Hall H, Bonaventure P, Sedvall G (Oct 2001). "Autoradiographic mapping of 5-HT(1B) and 5-HT(1D) receptors in the post mortem human brain using [(3)H]GR 125743". Brain Research. 915 (1): 47–57. doi:10.1016/S0006-8993(01)02823-2. PMID 11578619. Hasegawa Y, Higuchi S, Matsushita S, Miyaoka H (Apr 2002). "Association of a polymorphism of the serotonin 1B receptor gene and alcohol dependence with inactive aldehyde dehydrogenase-2". Journal of Neural Transmission. 109 (4): 513–21. doi:10.1007/s007020200042. PMID 11956970. Hawi Z, Dring M, Kirley A, Foley D, Kent L, Craddock N, Asherson P, Curran S, Gould A, Richards S, Lawson D, Pay H, Turic D, Langley K, Owen M, O'Donovan M, Thapar A, Fitzgerald M, Gill M (2003). "Serotonergic system and attention deficit hyperactivity disorder (ADHD): a potential susceptibility locus at the 5-HT(1B) receptor gene in 273 nuclear families from a multi-centre sample". Molecular Psychiatry. 7 (7): 718–25. doi:10.1038/sj.mp.4001048. PMID 12192616. Huang YY, Oquendo MA, Friedman JM, Greenhill LL, Brodsky B, Malone KM, Khait V, Mann JJ (Jan 2003). "Substance abuse disorder and major depression are associated with the human 5-HT1B receptor gene (HTR1B) G861C polymorphism". Neuropsychopharmacology. 28 (1): 163–9. doi:10.1038/sj.npp.1300000. PMID 12496953. Quist JF, Barr CL, Schachar R, Roberts W, Malone M, Tannock R, Basile VS, Beitchman J, Kennedy JL (Jan 2003). "The serotonin 5-HT1B receptor gene and attention deficit hyperactivity disorder". Molecular Psychiatry. 8 (1): 98–102. doi:10.1038/sj.mp.4001244. PMID 12556913. Sinha R, Cloninger CR, Parsian A (Aug 2003). "Linkage disequilibrium and haplotype analysis between serotonin receptor 1B gene variations and subtypes of alcoholism". American Journal of Medical Genetics Part B. 121B (1): 83–8. doi:10.1002/ajmg.b.20064. PMID 12898580. "5-HT1B". IUPHAR Database of Receptors and Ion Channels. International Union of Basic and Clinical Pharmacology. 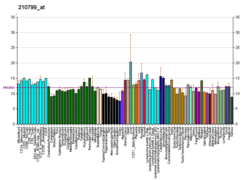 Human HTR1B genome location and HTR1B gene details page in the UCSC Genome Browser.